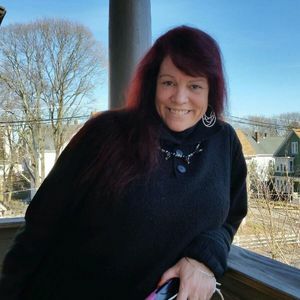 BROCKTON—-Kathleen M. "Kat" (Tinker) Farrell-Michel, 53, a resident of Brockton for the past 27 years, died Sunday, April 8, 2018 at Brockton Hospital. She was the wife of R. Patrick Michel for 24 years. Born in Cambridge, a daughter of Ronald and Mary (Vahey) Tinker, she was raised in Belmont and was a graduate of Belmont High School. She continued her education earning a Masters Degree in Marital & Family Therapy from Cambridge College. Kat was employed as the Director of High Point Treatment Center of Brockton. A member of the Board of Women's Spiritual Retreat-Women Rising Up, Kat enjoyed music, singing and art. In addition to her husband Patrick, she is survived by two sons, Matthew Farrell and his girlfriend Tabitha of Brockton and Patrick Michel of Brockton; her siblings, Brenda Donovan of Shrewsbury, William Tinker of Southbridge, Ronald Tinker of Southbridge, Mary Tinker of Lubec, Maine, Michael Coulliard of NC, Ronald Coulliard of NC., and Jason Coulliard of CA. ; a granddaughter, Makenna Farrell of Brockton; nieces and nephews. She was also the sister of the late Jamie Tinker. The beautiful and interactive Eternal Tribute tells Kathleen's life story the way it deserves to be told in words, pictures and video. How we used to hang out at your house cuz and always want to sleep over at Nanny Tinkers house, she would bring us to Downtown Crossing, to rub the stones at the graveyard. I love you cuz, give Nanny a big hug and kiss for me. Pat my deepest condolences for your loss. My thoughts and prayers are with you and your family. My dear sweet girl. We are going to miss you so much.Remembering all the wonderful times we had together. We will miss your laughter and your beautiful smile. You will be forever in our hearts. Kat was a beautiful spirit. She helped so many lost souls. She taught me a lot in the short time I knew her. She was loved and she'll be missed. God Bless her family, to whom she was so clearly devoted.